For service information in Marion County, click the photo above. To find out if we service your specific address, please use the online tool at the “Customer Service” link below. We provide a variety of commercial service options, each tailored to meet your specific needs. From weekly service of small plastic roll carts for home-offices and mid-sized steel containers for restaurants and mid-sized businesses, all the way up to roll-off type drop boxes for industrial applications. Most service is billed on a monthly basis, and containers are scheduled to be dumped at least once every week on regular weekly schedules. Weekly: $ 25.17/mo. $ 37.89/mo. $ 48.83/mo. **Please note that containers over 3 yards in size are not available with wheels, and must be positioned for drive up service. Please do not overload the container. Lids must close. Extras may be placed next to the container for pick-up. Additional charges will apply. Prohibited items include: Appliances, tires, car batteries, paint, fluids, concrete, dirt, rock, TV’s, and Computers. We are able to collect these items separately for nominal fees. Call our office staff for details. We are able to provide mixed recycling service to our commercial customers, as a part of Marion County’s curbside residential roll cart program. Call our office for details. For immediate drop off of large volumes, there is also a daytime recycling depot at Marion Resource Recovery; 3680 Brooklake Rd. in Brooks, OR. We provide a variety of service packages, with garbage service tailored to meet your specific needs. Service packages are designed to encourage recycling by providing the largest possible container for recyclables, and by charging a rate for the whole package based on the size of the garbage cart. Curbside packages include weekly service of the garbage and every other week service of the recycling. At the time of delivery, you will receive a handy brochure that explains what is recyclable; as well as a color-coded calendar that tells you which weeks to set out the blue recycling cart. All carts need to be at the curb, with lids opening toward the street, no later than 6:00 a.m. on the regular collection day. Please allow a minimum space of 4 ft. between containers and other obstacles, to allow for our automated grippers. All packages include a 95 gallon blue cart for mixed recyclables and a grey cart for garbage. The rate for the whole package is based on the size of the garbage cart. Grey Cart:>> 20 gal. 35 gal. 65 gal. 95 gal. Monthly Rate: $ 29.59/mo. $ 30.42/mo. $ 38.00/mo. $ 46.29/mo. We can deliver 1, 2, or 3 yd. commercial containers for special clean-up projects. All rates are based on a monthly rental with four dumps included. A one-time delivery fee of $35.00 will apply. We can also pick up piles of loose material (see “Special Removal and Clean-Up Services” tab above for more info), if you don’t have enough material to make getting a container for a month cost effective. Call us for a free estimate on the most economical disposal options. Please do not overload the container. Lids must close. Extras may be placed next to container for pick-up. Additional charges will apply. Prohibited items include: Appliances, tires, car batteries, paint, fluids, concrete, dirt, rock, TV’s, and computers. We are able to collect these items up separately for nominal fees. Call our office for details, at (503) 585-4300. For industrial-sized jobs, like roofing, we offer a variety of drop-box, or roll-off, containers. They are available in 10, 20, and 30 yard sizes. (If you don’t know how much material you have, the comparisons listed below may be helpful.) Rates for service include one dump and 2 weekdays rent. We do not charge rent over the weekend. We may also be able to offer special rates for clean loads of wood, yard debris, or inert materials such as cement, bricks, etc.) Drop boxes have doors on the back for easier loading. All boxes have a load-weight limit of 20,000 lbs, and must be no more than level-filled. Items cannot extend above the top rail of the box. Prohibited items include: Appliances, tires, batteries, paint, liquids, concrete, dirt, rock, computers and TVs. We are able to collect these items separately. Additional charges may apply. We do require 24 hrs. notice for weekday delivery or hauling of drop boxes. 95 gallon The size of the blue recycling carts that you see within Marion County. 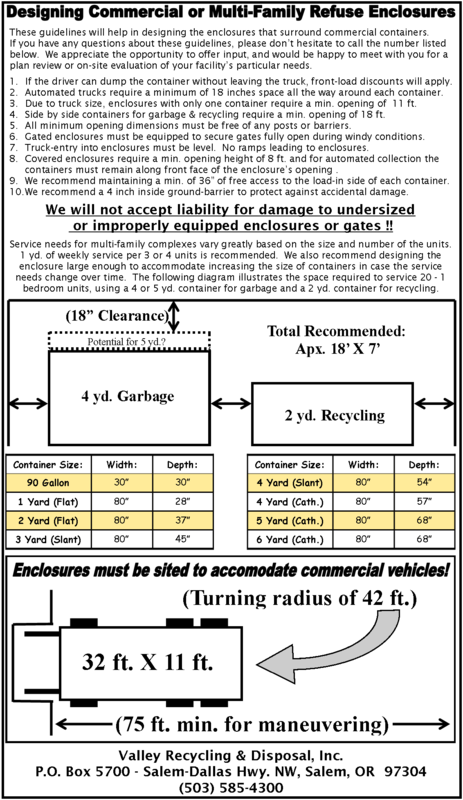 Residential service packages include a 95 gallon blue cart for mixed recycling. Garbage collection is weekly, but recycling collection is every other week. 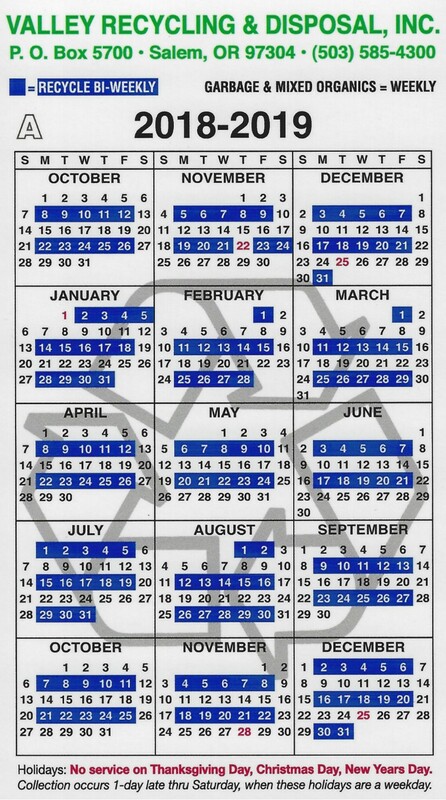 We provide you with a convenient, color-coded calendar that tells you which weeks to put out the blue cart. Even if you’re not a regular, weekly garbage customer, you may be able to take advantage of curbside recycling for a small monthly fee. We also provide you with a convenient recycling guide to let you know what can be recycled.